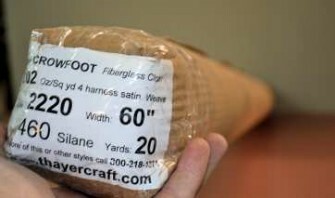 We at Thayercraft go above and beyond the call of duty to get fiberglass cloth to you in good shape. Most lightweight fiberglass cloth is rolled in at least 10, 20, 30 and 50 yard rolls. Some are done up to 125 yards. Some 5 yard rolls of the heavier weight cloth are done also. These small rolls are rolled on the light weight 2" PVC pipe. Because fiberglass cloth is made from glass which is non elastic we do this by hand. We have tried mechanical rollers in the distant past but couldn't seem to make it work without getting wrinkles. So the process we have been using for long time now is to carefully and painstakingly roll the cloth by hand and in a way that prevents wrinkles. This can be very difficult for the tighter woven fabrics. The cloth goes from the mother roll to the take up roller and is not touched by our hands at all except for the very end of the start up section next to the 2" PVC pipe core and very minimal touching at the end. At this point paper, or other print prevent material, is placed in the cloth and started just before the cloth is cut. The rolling is contnued with the paper, or sometimes a felt like polyester material, on the outside of the cloth. This smooth layer is put on to prevent indents from subsequent packing layers. Sometimes we have used other types of fiberglass cloth for this print prevent layer. So when you're unpacking the roll of fiberglass cloth you received and you see this cloth you may think you got the wrong cloth but just keep going and you'll find the cloth you bought just underneath. 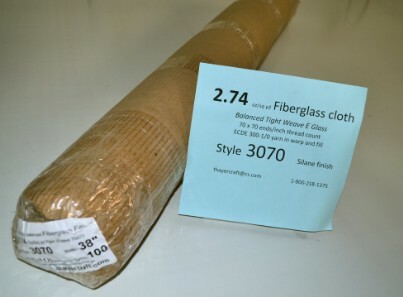 Some weaves of fiberglass cloth will copy anything sitting next to it such as other packing layers. We do our best to keep this from happening. We keep all layers going in the same direction so that no layers are doubling back on any previous layers. This keeps the roll tight avoiding wrinkling and skewing, or sometimes called telescoping. After the print prevent layer the cloth is put in plastic and finished with corrugated wrap. There are identification labels of the on the roll and on each end of the outside. No tape is put anywhere except for the very outside. We don't put tape on cloth anywhere. We pack the small rolls in corrugated wrap to keep the cloth nice and secure to prevent the skewing. Unpacking the rolls can be a bit of a challenge but just take a sharp knife and carefully cut under the seam and just score around the end labels and everything comes apart pretty good after that. It's just getting past the very outside corrugated wrap. Larger rolls in boxes less than 150 pounds. We use full overlay high strength boxes that are commongly 42x10x10", 46x10x10", 53x10x10", 54x10x10 and 64x10x10. We always put the little flaps in between the big flaps and use reinforced tape on sealng the edges on the complete bottoms. The rolls are wrapped in bubble pack and any extra space is taken up with crumpled up kraft paper - We don't use popcorn chips, except in some unusual circumstances. I won't say never but not normally. The rolls are in the box and 9.5 x 9.5 masonite pieces are placed in the ends and voids filled with crumpled up kraft paper so the rolls stays nice and secure and reinforced tape is put in strategic locations. Rolls from the factory have good labels on one end. We add out label for added identification on the opposite end. Clear tape is put on to completely cover both ends. 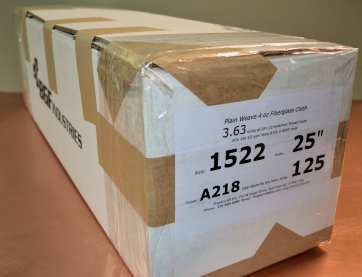 All boxes are individually well taped, labeled and placed longitudinally on pallets. The heavier rolls are placed lower and more central. 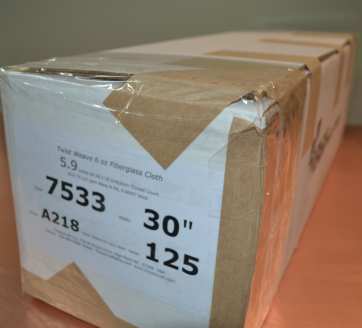 The number of boxes on a pallet varies depending on the size of the boxes. For 10x10" boxes normally 16 to 20 boxes are put on with 4 each layer. The rolls/boxes are stretch wrapped and strapped. We put several ship to labels on each pallet and one copy of the invoice/packing list on each pallet. For international shipments we give the trucking company driver 3 bill of lading copies, our company/commercial invoice and a NAFTA copy. 2" PVC pipe. We re roll 90% of rolls on 2" diameter light weight foam core PVC pipe. The pipe is generally cut 1.5" longer than the width of the cloth. Some cloth labeled as 38 is actually 38.5" with the feather edge with some up to 39" so the pipe will be cut 40" generally for any cloth labeled 38". A 40" 2" diameter foam core pipe weighs 24 oz or 1.5 lb A dense schedule 40 2" pipe, on the other hand, weighs 37 oz or 2.3 lbs. or 1.5 times as much. (*2" foam core pvc weighs 7.2 oz/ft or 0.6 oz per inch vs 11.1 oz/ft or 0.9 oz per inch). Factory Cores: A 42" long 5"od x 3"id factory core weighs 12.8 lbs. or 4.8 oz per inch. Thinner wall factory cores are less. 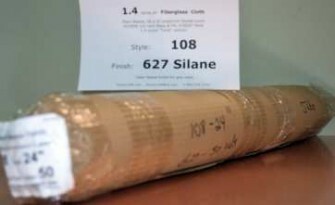 A 38" wide roll of fiberglass cloth up to 20 pounds will have another pound or so of paper and or polyester felt material, labels, plastic sleeve, bubble pack and corrugated wrap. Weights of boxes: a 42 x 10 x 10" box weighs 4 pounds with a 64 x 10 x 10 box weighing 6 lbs. You can calculate the weight of the cloth for any yardage by using its oz/sq yd data. For example a 20 yd roll of 7500 38" will be 9.6 oz/sq yd divided by 16 oz/lb for 12.0 lbs times the 38" width divided by 36" to get the total weight of 12.7 lbs. 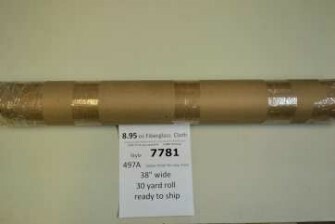 A 20 yd roll of 7500 38" should weigh close to 15.2 lbs which would be counted as 16 pounds by UPS and other carriers.